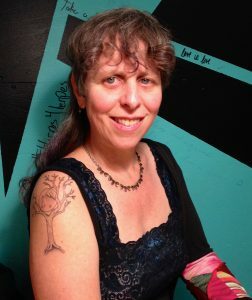 Su J. Sokol is an activist, a cyclist, and a writer of speculative and interstitial fiction. A former legal services lawyer from New York City, she immigrated to Canada with her family in 2004 and now makes Montréal her home. Su works as a social rights advocate. Elle parle français avec un accent New Yorkais. Su’s debut novel, Cycling to Asylum, was long-listed for the 2015 Sunburst Award for Excellence in Canadian Literature of the Fantastic. Her short stories have appeared in The Future Fire, Spark: A Creative Anthology, the TFF 10th Anniversary Anthology, and Glittership: an LGBTQ Science Fiction and Fantasy Podcast. Su also participates in and curates literary readings in Canada and abroad, and her reviews have been published in Matrix Magazine. For the past three years, Su has served as a panelist at the Conference on Canadian Content in Speculative Arts and Literature, and for the past two years, she has curated the Belles Lettres readings for NDG Arts Week.